VILLA FLORA is a spacious 95 square meter one story home with stunning views of the ocean, at 3 km away from the center of Positano. It has 3 bathrooms and 3 bedrooms. The villa can accommodate comfortably 6 guests. It is equipped with air conditioning and Internet. The villa also has its' own private parking. 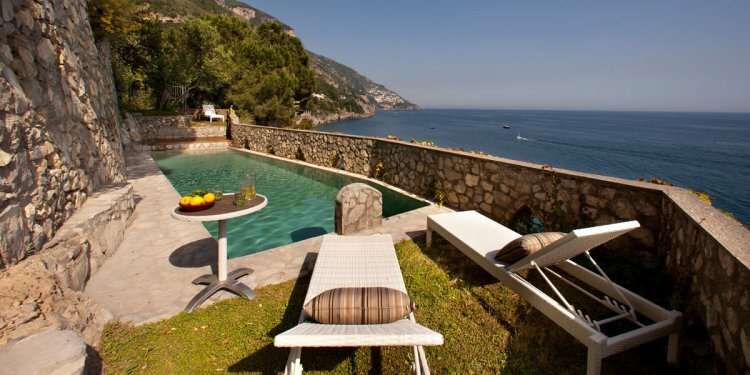 This tranquil villa is nestled into the mountainside on one of the worlds' most famous coastlines, the Amalfi Coast. With panoramic viewpoints from all angles, the combination of soaring mountains and vertical cliffs disappearing into the deep blue sea, the view is simply spectacular. As a backdrop for this idyllic property, are the "Monti Lattari" mountain range, for which the Amalfi Coast is so famously renown. Villa Flora is the ideal destination for couples or families who wish to vacation in a quiet and relaxing environment, surrounded by lush vegetation, olive orchards, breathtaking mountains and glistening sea. The villa is located only three km away from the much sought-after town of Positano and other scenic coastal towns not far away. The villa, which sits on one of the most famous coastlines existing, between breathtaking cliffs and unending sea, venturing out in any direction will always be a pleasure. The nearby towns of Sorrento, and panoramic Sant' Agata sue due Golfi are a short drive away. Alternatively, heading out along the coastline, you will be greeted first by Positano and venturing further along, reach the towns of Praiano, Amalfi and Ravello, to name just a few. These destinations are also accessible by public transportation, with a bus stop located near the villa. From the main road, approx. 400 meters along, there is the path (approx. a 20 minute walk) that leads down to one of the most pristine and untouched beaches of the Amalfi Coast, Tordigliano beach. It is a challenging path, and therefore not suitable for everyone (e.g. small children). However, for those who enjoy outdoor exercise, one will certainly be rewarded upon arriving to this destination of tranquil and unspoiled beach. From the villa, there is a private driveway of 300 meters that leads down to the main road, where the parking for one vehicle (one mini-van) is available. You will reach the villa by foot along a private driveway (approx. 300 meters from the parking to the front door). Upon arrival the property owner will meet his guests at road level and accompany them with their luggage, up to the villa by car. As the driveway is fairly steep and narrow, it is advised for the guests to always leave their vehicle in the parking at road level. After a panoramic ride up to the villa through olive trees and lush vegetation, one reaches the courtyard and main entrance to the villa. The villa is part of a four story structure, with its' own private entrance and private terrace.